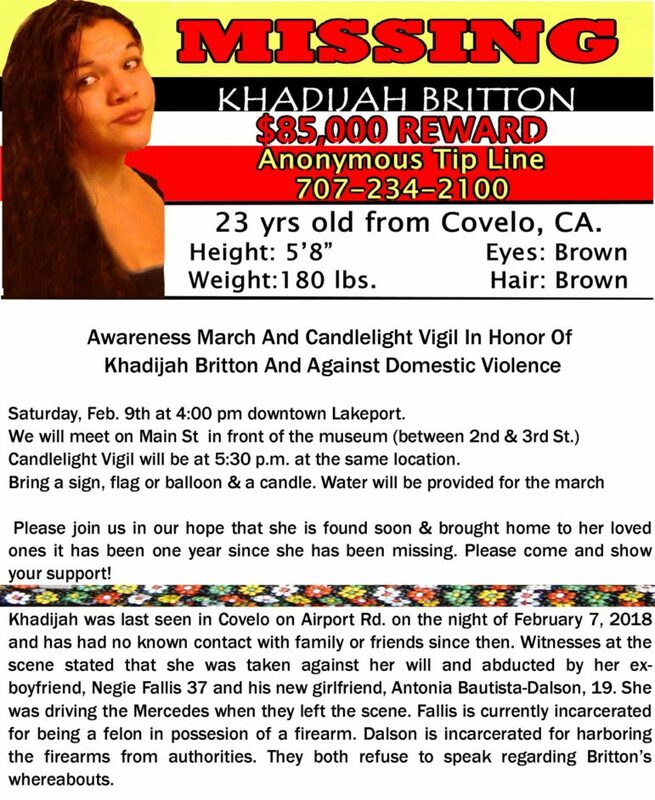 MENDOCINO Co., 2/8/19 — Khadijah Britton was last seen in Covelo on February 7, 2018, allegedly being forced into a car at gunpoint by her former boyfriend, Negie Fallis. More than a year later, the 24 year old woman remains missing, despite ongoing searches, a substantial reward for information, and a widespread community effort to locate her. To highlight Britton's continued absence, two vigils are planned for Saturday, February 9, commemorating one year since she was last seen. Family and friends have organized a walk through Covelo for Saturday, beginning at 2:30 p.m., followed by a candlelight vigil around 5:30 p.m. The walk will begin at Dan's Market, and then go through town past the high school and return to Keith's grocery store, where the vigil will take place. In Lakeport, people will gather on Main St. at 4 p.m. outside the museum, between 2nd and 3rd Streets for a march, and then a vigil will take place at 5:30 p.m. People are asked to bring candles, signs, and balloons (see flyer below). Over the past year, community members have spoken out about her absence and organized vigils, searches, fundraisers, and participated in marches connecting Britton's absence to domestic violence and the Missing and Murdered Indigenous Women's movement, including at several of this year's Women's Marches — but Britton remains missing. 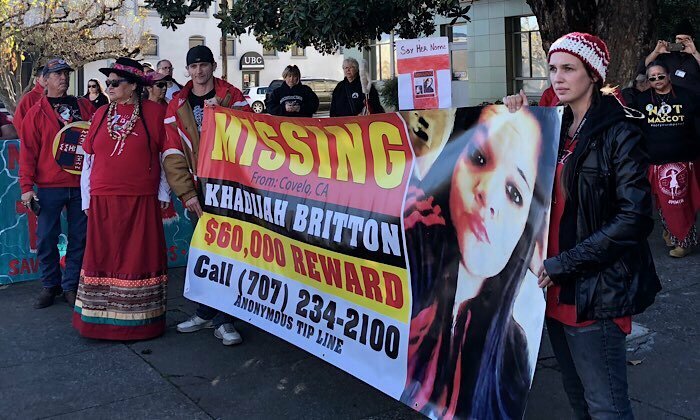 No charges have been brought by the Mendocino County District Attorney's Office regarding Britton's disappearance, despite an ongoing search for her throughout Northern California. The primary suspect in her disappearance, her former boyfriend Fallis, was sentenced to state prison in December for being a felon in possession of a firearm, in an arrest related to an alleged violent beating of Britton. His accomplice, Antonia Bautista-Dalson, was also charged. The Mendocino County Sheriff’s Office continues to seek any information related to Britton’s disappearance, and a significant reward is being offered for any information that helps find her: $85,000 for information leading to her, and an additional $25,000 for information leading to a conviction and arrest. Anyone with information about Britton should contact the MCSO tip line at (707) 463- 4086 or the tip line (707) 234-2100, or the anonymous WeTip service at 1-800-78-CRIME. You can read The Mendocino Voice’s complete coverage of Britton’s disappearance and Fallis' legal proceedings here. Flyer for the Lakeport march and vigil on Feb. 9.